Ad-hoc networks have long been studied as an ideal technology to provide communications in emergency operations when network infrastructures are not available. Nevertheless, this area has not yet delivered enough mature technologies or working prototypes. We suspect that, among other issues, this is due to a lack of understanding of this application domain that forces researchers to make too many assumptions. One of those concerns is the mobility of network nodes. 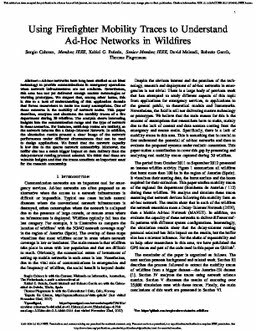 This paper describes, analyzes and simulates the mobility traces of a fire department during 30 wildfires. The analysis shows interesting insights into the communication range and the type of network in these scenarios. For instance, multi-hop routes are unlikely, so the network behaves like a Delay-Tolerant Network. In addition, the simulation results present a clear image of the network performance under different circumstances that can be used to design applications. We found that the network capacity is low due to the sparse network connectivity. Moreover, the buffer size has a much bigger impact on data delivery than the delay-tolerant routing protocol selected. We think that these are valuable insights and that the traces constitute an important asset for the research community.